Cricket net system. 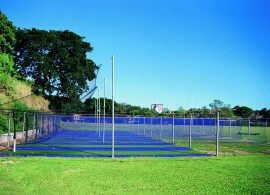 Fixed cricket practice nets take up large areas, CRS’s cricket net system is designed to store away when not in use— making practice areas available for other activities. The system’s modular design allows for the addition of extra nets as required — making the system both cost and space efficient. After use the nets are easily slid back to the stored position or removed completely. Ground sleeves are supplied to make posts removable, which makes it easy to remove the total system, opening up the area for other activities. Caps are supplied to cover exposed holes when posts are removed. Back and side nets are quickly bound together with vinyl pockets and eyelet clips stitched to the nets. Nets are banded all around with black PVC edging and have galvanised rings installed in top and bottom at 400mm centres. Nets can be slid along cabling with minimal effort. The galvanised steel top cables, which are supplied with either turnbuckle or winch, keep all nets neatly in position.